Develop your science and your army, construct prestigious buildings and lead your civilization to victory! 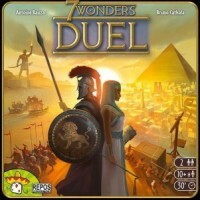 7 Wonders: Duel is a stand-alone game in the world of 7 Wonders, made especially for 2 players. 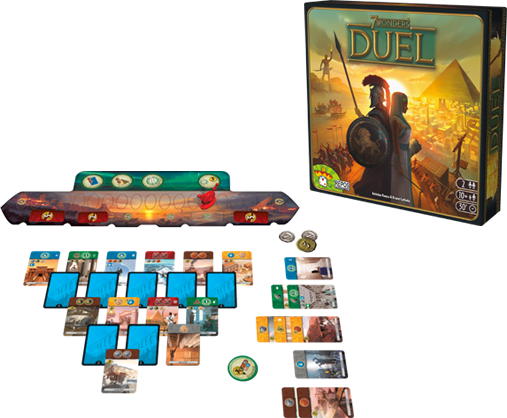 7 Wonders: Duel offers a whole new system of card drafting, 3 victory conditions, scientific progress, an original military system, and 12 Wonders to combine for addictive and continually new games. Get a glimpse into 7 Wonders: Duel. I love card drafting, don’t get me wrong. Star Realms is also a favourite of mine but the fact that you can see all the cards (some hidden) in the towers gives 7 Wonders a whole new amazing feel. Still the same feeling of urgency and choices. Amazing back and forth with your opponent. The fact tha specializing i n military and science can have devastating effect to yourt opponent fits perfectly with the theme. Adapt or die! Recommend that you play with expansion Pantheon. Add a Review for "7 Wonders: Duel"